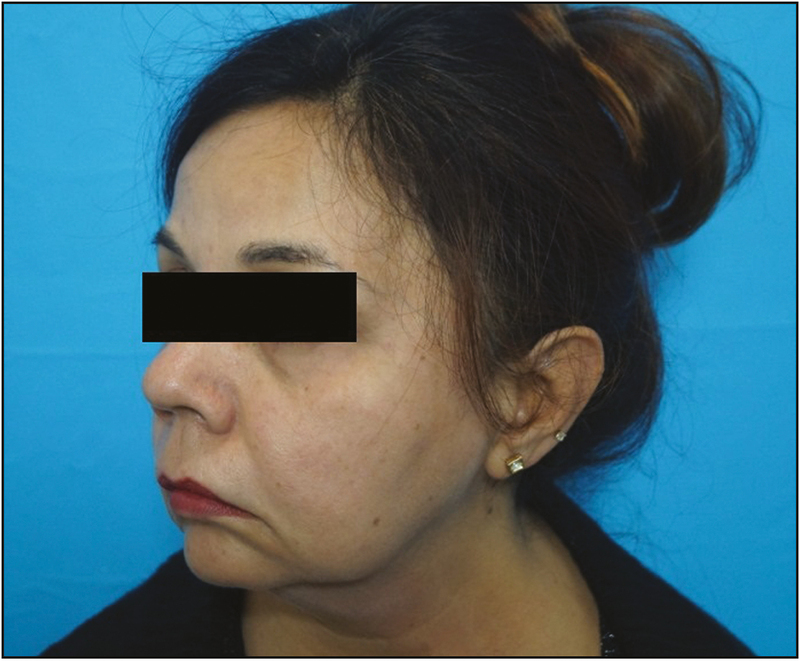 Keymessage: The application of subcutaneous suspension with a reabsorbable thread in conjunction with dermal fillers constitutes an effective and safe procedure for face-lifting and rejuvenation in case of a long-standing facial paralysis. In this case study, we are discussing the outcome of treating a patient of facioscapulohumeral muscular dystrophy (FSHMD, FSHD or FSH) with thread lifting. FSHMD, FSHD, or FSH—originally named Landouzy–Dejerine—is usually an autosomal-dominant inherited form of muscular dystrophy (MD) that initially affects the skeletal muscles of the face (facio), scapula (scapulo), and upper arms (humeral). A progressive skeletal muscle weakness usually develops in other areas of the body as well, which is asymmetrical. Facial muscle weakness leads to eyelid drooping, inability to whistle, and difficulty pronouncing the letters M, B, and P.
The gold standard for facial rejuvenation is the face-lift surgery. However, it is a more invasive surgical procedure and requires a longer recovery time. The recent introduction of absorbable barbed threads, producing a mechanical tensile effect (lifting effect) associated with the biological effect (neocollagenesis), is a good alternative. It has a shorter recovery time and patient inactivity in relation to the conventional plastic surgery. It allows association with other nonsurgical procedures, such as botulinum toxin use and/or cutaneous filling in facial remodeling for a holistic approach. The fibrosis process is followed by fibrous tissue contracture and traction on the skin and results in skin tightening. The barbs (cogs) on the thread get hooked and adhere to the tissue providing a firm grip (anchorage effect). The implanted thread undergoes biodegradation consisting of hydrolysis, fragmentation, absorption, and excretion. The reabsorption occurs because of the action of the histiocyte reticular system, which leads to a selective hydrolysis action of the reabsorbable thread from the outskirts toward the center. 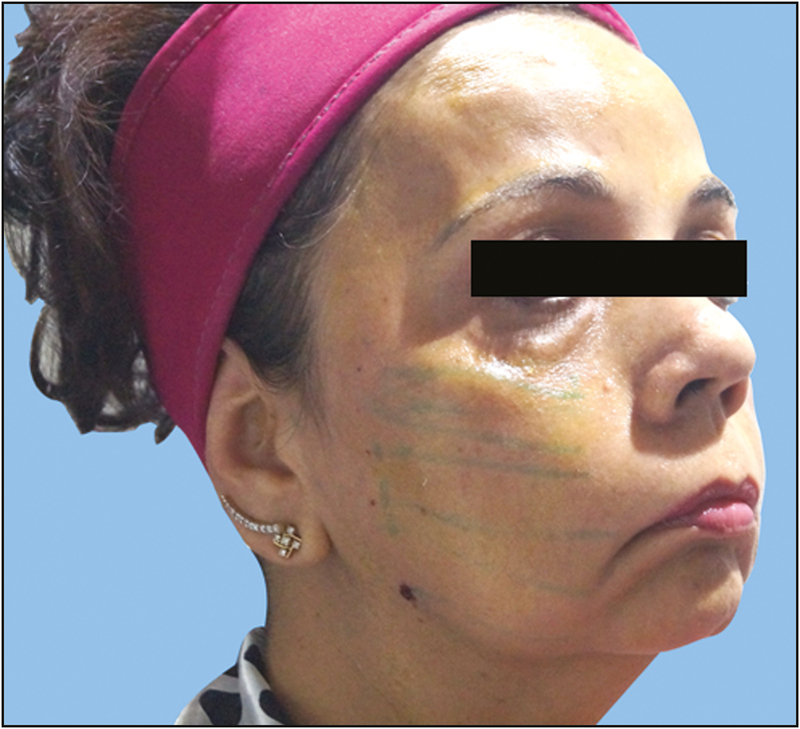 This case report is designed to assess barbed thread lifting outcome in combination with dermal fillers. Assessment is carried out regarding complications, degree of lifting, and patient satisfaction. The 57-year-old woman, gynecologist by profession, had been diagnosed with FSHMD at the age of 40 years with the aid of muscle biopsy as told by the patient and seen on records by the neurologist. 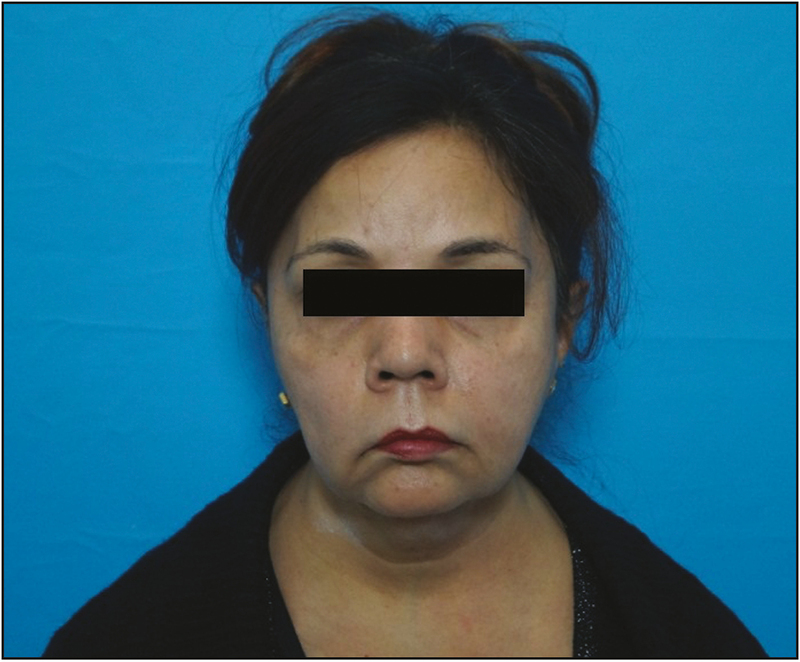 She presented with facial muscle weakness, loss of subcutaneous fat, and drooping of the angle of mouth, which was more prominent on the right side. Along with this, she presented with skewed facial expression, tear trough, deep nasolabial folds, marionette lines, laxity, and jowls because of aging process. It was affecting all facial layers, skin, subcutaneous fat, sub-facial musculoaponeurotic system, deep fascia, the retaining ligaments, neurofacial muscle activity, and even the facial bony skeleton. 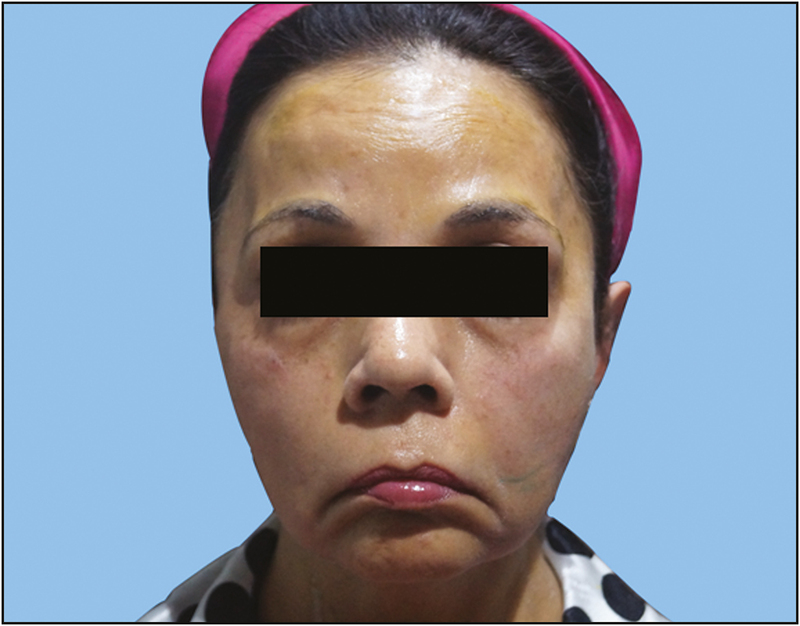 Five unidirectional cog threads (70mm, 21 gauge) were used on each side on the cheeks along with 2mL of Juvederm Ultra Plus XC (with lignocaine) and 2mL of Juvederm Voluma XC, (Allergan) (with lignocaine) for facial rejuvenation (one of each on one side). Four Polydioxanone (PDO) monothreads (50mm) were used for double chin. Written informed consent explaining the downtime, results, and side effects of the procedure was signed by the patient. Topical local anesthetic cream was applied for 40min. Technique was performed as an outpatient procedure under aseptic condition. Marking was made on the patient according to the vector, which showed the maximum lifting. Two entry points were marked: one on the most lateral point on zygomatic arch, first line was drawn from the marked point to ala of nose and the second line to the nasolabial fold (2cm above the angle of mouth). Second entry point was marked in front of the tragus, third line drawn to the marionette line and fourth line to the jowl. A fifth line was drawn from the first point to the angle of mandible [Figure 1]. Local anesthesia infiltration was carried out at the site of entry with 2% lignocaine hydrochloride (1mL bolus injection). A 22-gauge needle was inserted at the subcutaneous level to make the entry of cannula easier. A 22-gauge cannula attached to a 2-mL syringe, containing 1% lignocaine hydrochloride (diluted from 2% lignocaine) without adrenaline, was inserted along the subcutaneous plane and the anesthetic agent was injected along the tract formed in retrograde manner. The skin was stabilized by the nonoperating hand and the cannula holding the thread was inserted at the entry point at 90° with the skin surface till passing the dermis. Then the cannula holding the thread was repositioned parallel to the facial skin and inserted subcutaneously following the tract already formed by the cannula. Mild resistance was felt. No dimpling or puckering was noticed during the insertion of the thread [Figure 2]. Thread cannulation was stopped nearing proposed crease, for example, the nasolabial crease and marionette line. External part of the cannula was rolled by the dominant hand and gentle pressure over the skin was put by the other hand to anchor the barbed cog thread inside the tissues. Cannula was withdrawn leaving the thread inside the track. All other threads were inserted through the proposed subcutaneous track on both sides of the face. Gentle traction force was applied bilaterally on the corresponding threads at each side. Finally, the extra length was cut with scissors. Antibiotic cream was applied at the entry points. On neck, four PDO monothreads with 50-mm length were placed intradermally in a parallel technique, that is, parallel to each other and to the skin, in opposite directions. Tear trough, nasolabial folds, and marionette lines were filled following MD codes with 4mL hyaluronic acid Food and Drug Administration (FDA)-approved fillers. Postprocedural instructions were given to the patient to avoid exercise for 48h, avoid facial massage, and limit facial muscle overactivity for 24h [Figures 3], [Figures 4], [Figures 5], [Figures 6], [Figures 7], [Figures 8]. 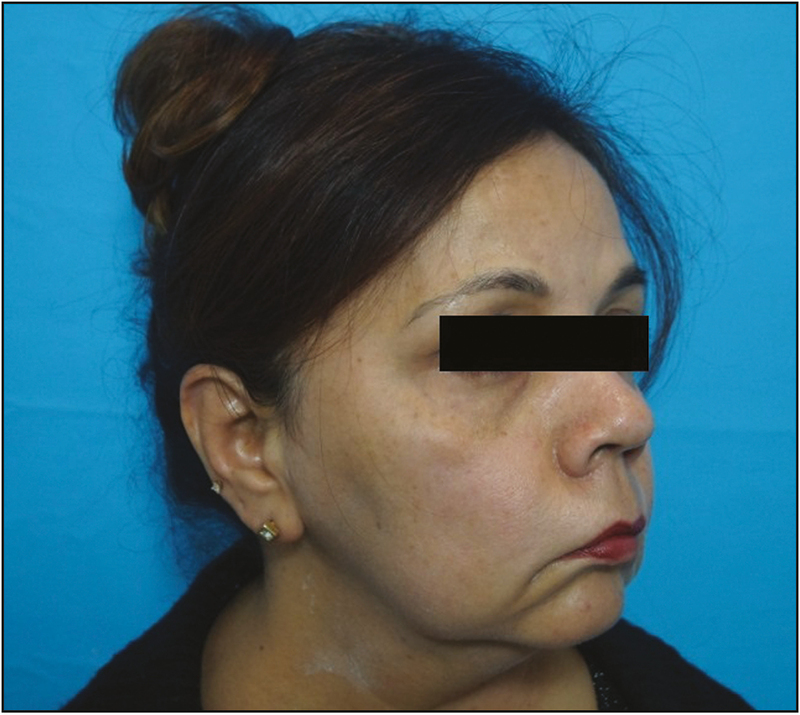 The patient noticed immediate improvement in relation to jowls, nasolabial folds, and marionette lines with some amount of traction because of threads. Minimal downtime was seen due to inflammation and the local anesthesia. No bruising was noticed, mild tenderness at the entry point was felt for a day. On follow-up after 3 weeks, she was very satisfied with the jawbone contour improvement, nasolabial folds, and the symmetry achieved. As her right side was more affected, her submalar area still appeared mildly deflated compared to the left side for which she was suggested more dermal fillers. 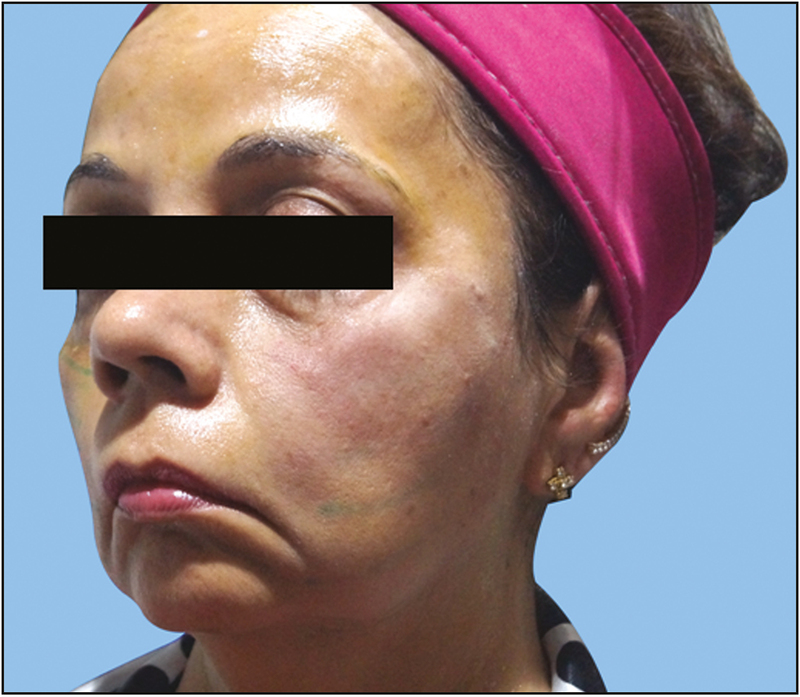 Surgical face-lift is still the best option for the rejuvenation and repositioning of the facial tissues affected by ptosis; however, it demands a greater recovery time for the patient, in spite of greater surgical risks. Thread lifting was introduced to contribute to the facial rejuvenation treatment while reducing the downtime. It shows excellent results in the middle and lower third of the face and has an elevated patient satisfaction index. The immediate effect is the lifting of the tissue because of the mechanical action produced by the thread. This is possible due to the arrangement of the threads’ barbs that function as a hook and at the same time, prevent the sliding and movement of the thread. Once positioned in the subcutaneous tissue, they will continue to practice their sustaining action on the tissues. It is an advantage compared to the monofilament threads as these barbs are positioned in one direction. Therefore, even if widespread, they lift the tissue in only one direction. The lifting effect is guaranteed and fortified by the cutaneous reaction (fibrosis) that appears along the length of the thread, which remains effective and steady even when the thread is completely reabsorbed (after approximately 6–12 weeks). Patients now prefer minimal invasive procedures with lesser downtime compared to invasive time-consuming surgical face-lift. With the recent advancement in thread lift and the introduction of PDO cog threads, it is feasible to achieve satisfactory results in skin rejuvenation and asymmetry, which is cost-effective with less downtime and no major side effects. 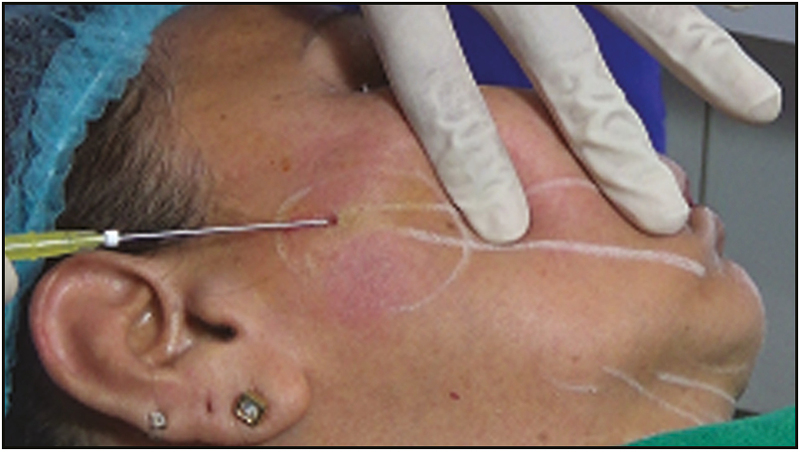 The application of subdermal suspension with a reabsorbable thread in conjunction with botulinum toxin (not performed in our patient as she has FSHMD) and dermal fillers constitutes an effective and safe procedure for face-lifting and rejuvenation of a drooping face as a result of long-standing facial paralysis. Sulamanidze MA, Fournier PF, Paikidze TG, Sulamanidze GM. Removal of facial soft tissue ptosis with special threads. Dermatol Surg 2002;28:367-71. Rickard AM, Petek LM, Miller DG. Endogenous DUX4 expression in FSHD myotubes is sufficient to cause cell death and disrupts RNA splicing and cell migration pathways. Hum Mol Genet 2015;24:5901-14. Khazanchi R, Aggarwal A, Johar M. Anatomy of aging face. Indian J Plast Surg 2007;40:223-9. Shimizu Y, Terase K. Thread lift with absorbable monofilament threads. J Japan Soc Aesthetic Plast Surg 2013;35:2. Monheit GD. Suspension for the aging face. Dermatol Clin 2005;23:561-73, viii. Paul MD. Using barbed sutures in open/subperiosteal midface lifting. Aesthet Surg j 2006;26:725-32. Yarak S, de Carvalho JAR. Facial rejuvenation with absorbable and barbed thread lift: case series with Mint Lift™. J Clin Exp Dermatol Res 2017;8:415.